The reason to camp is to "get away from it all," and Florida's State Parks do offer a quiet respite from the hustle and bustle of daily life. That doesn’t mean that they’re boring places. There are a wide array of activities to be found both in the parks and nearby — beaches, bicycling, birding, boating, canoeing, equestrian trails, fishing, hiking, inline skating, kayaking, museums, picnicking, playgrounds, scuba diving, snorkeling, swimming, tubing, and camping. Primitive Camping. Primitive camping is available in some of Florida’s State Parks. It is usually inaccessible by car, so camping equipment must be carried from a parking area to the campsites. Primitive campsites may include a fire ring and picnic table, but most likely will not include water and electric. These sites are usually very inexpensive. Full-Facility Camping. Tent, trailer and RV camping is available with a variety of campsite amenities, including electric hookups, fire rings, picnic tables and water. In addition, comfort stations are provided. Most include flush toilets, hot showers, and laundry facilities. Dump stations are provided. Campsites usually allow up to eight people, two tents or one trailer or RV and two vehicles. Camping Cabins. Staying at some of Florida’s State Parks could be as easy as packing a few clothes, some food and your toothbrush. Some camping cabins come equipped with everything else you’ll need down to the linens. However, if you’re traveling with your pet, you’ll want to make other arrangements. Pets are not allowed in the camping cabins. Cabins vary in style from fully-equipped modern cabins to hand-hewn lumber or palm-log retreats, and usually accommodate up to six people. 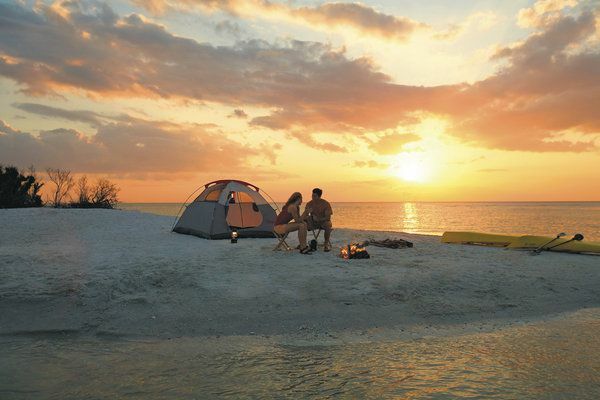 Camping is available in about 50 of Florida's 161 State Parks. If you're wanting to camp, finding a State Park is as easy as visiting its Website at www.FloridaStateParks.org where you will find a list of State Parks broken into types of camping — Cabins, RV Camping, Full Facility Camping, Pet Camping, Group Camping, Primitive Camping, and Youth Camping. Once you find a park where you think you'd like to camp, click on the link to find out information about that particular park. About halfway down the middle of the page should be a "Book Campsite Now" icon that will lead you to ReserveAmerica.com. Reservations may be made from one day prior to arrival up to 11 months in advance. ReserveAmerica.com is easy to navigate and has a host of helpful information, including campground details and a campground map. Each campsite will note its size, access, type of camping unit allowed and amenities. Payments will be charged to your credit card (American Express, Discover, MasterCard or Visa) upon completion of your reservation and there is a cancellation fee to cancel a reservation any day prior to the arrival date. Any cancellations on the day of arrival or later will also be charged the first night's camping fee. Discounts of a half-off camping fee are available to Florida residents who are 65 years old and older or 100% disabled. Discount must be mentioned when making reservation and proof must be provided at check-in. Florida's State Parks are open from 8:00 a.m. to sunset every day of the year. Gates are locked at that time, so if you are going to be arriving late you should call the park in advance for the gate code. If you qualify for a discount, proof will be required at check-in. While we have never been asked for the information, proof of up-to-date immunizations for pets should be made available. Also, if you are bringing horses, proof of negative Coggins will be required. Quiet time each evening is usually from 10:00 p.m. or 11:00 p.m. until 8:00 a.m. the next morning. All plants and animals are protected. Do not feed wildlife. Do not cut any trees or vegetation. Do not attach ropes or tie any object to trees. Children under 16 must be supervised at all times while inside the park. Children under 16 must wear a helmet when riding a bicycle. Gray water and sewage must be dumped in the dump station. No alcoholic beverages are permitted outside of designated campsite or cabin. Fires are limited to grills or fire rings. Firewood is usually on sale at the Entrance Station. No collecting of live or dead firewood (limbs, branches, logs, etc.) is permitted inside the park. Pets must be confined or leashed at all times (leashes may not exceed six feet). Pets must be well behaved all times and confined within the campers' unit during quiet time. Pet owners are required to pick up after their pets and properly dispose of droppings in trash containers (they make this easy by providing Mutt Mitts at restroom facilities). Pets are not allowed in cabins, restrooms or park facilities. Horses must have proof of a negative Coggins test. Enjoy camping Florida's State Parks, but remember leaving your campsite clean and nature untouched will ensure the preservation of Florida's State Parks for the enjoyment of future generations of campers. There is a sign at the entrance to a trail at Hillsborough River State Park that simply states, "Please Take Nothing But Pictures... Leave Nothing But Footprints."